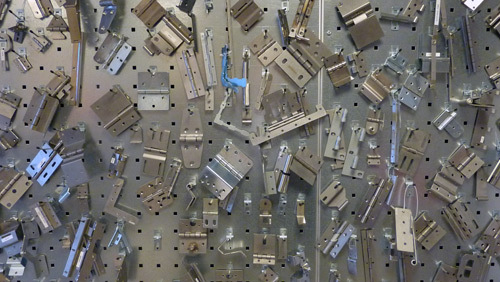 Bosch Scharnieren (‘Bosch Hinges’) was the first company in the Netherlands that implemented Quick Response Manufacturing (QRM), to shorten the throughput times for customer-specific production. What did they learn in the past ten years? Bosch Scharnieren (‘Bosch Hinges’) is a SME company that manufactures stainless steel hinges. 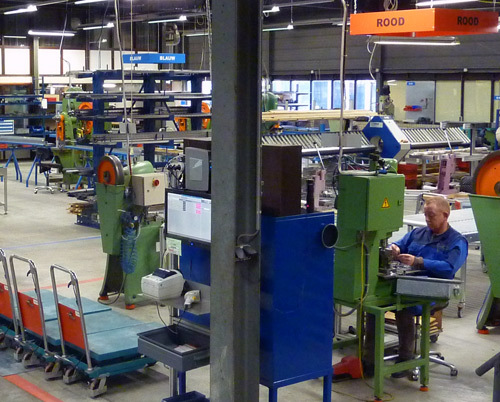 Ten years ago, they were the first in the Netherlands that started to apply Quick Response Manufacturing (QRM). 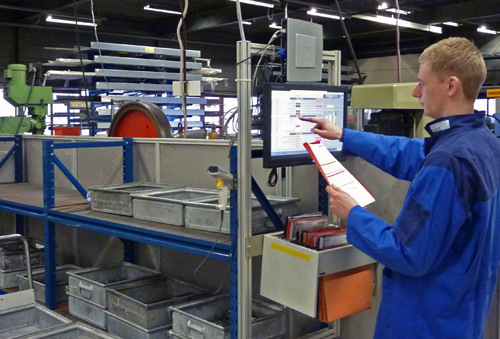 Like Lean, this improvement method focuses on throughput-time reduction. However, QRM encompasses specific methods and tools to do this in an environment with high mix, low volume production, see the box below. Which lessons did Bosch Hinges draw in the past decade, and what does this mean for the applicability of QRM in other companies? Quick Response Manufacturing (QRM) is a process improvement method developed from the standpoint of logistics. It aims to improve the flow. QRM increases the throughput, by reducing waiting times. 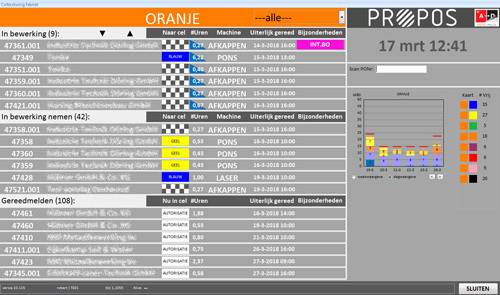 The most important difference with Lean is that QRM was developed specifically for high-mix / low-volume production. Besides this, QRM uses only one performance indicator, the Manufacturing Critical-path Time (MCT). This is the time from the raw materials until product delivery. The underlying idea: Reduction of the MCT reduces the overhead, and consequently the non-value adding activities, the most. Important QRM tools are Quick Response Cells (QRC’s) and POLCA. QRC’s are multidisciplinary teams that autonomously perform a number of sub-processes for Focused Target Market Segments. POLCA is a Kanban variant which regulates the workstreams between the QRC’s, on the basis of pull signals. The logistic challenges that companies can face, can be described with a railway metaphor. In companies with mass production, semi-finished products move like "express trains" along the processing stations. This situation is ideal for the formation of (Lean) production lines. The waiting times between the stations are than almost zero. Intermediate stock, if any, can be managed with Kanban cards. These send out a signal when replenishment is needed. 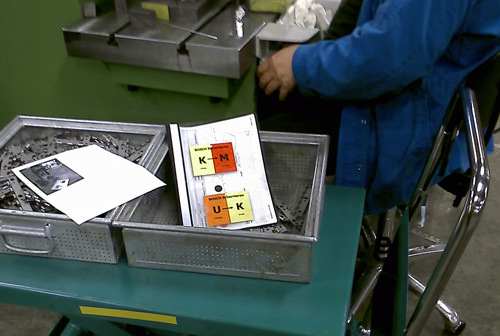 In companies with customer-specific production, semi-finished products move like "regional trains" along a number of processing stations, selected beforehand. So, each train follows its own route. The work content at each station could be compared with the time passengers need to board and unboard. Often, this time span can be estimated fairly well. This is also true at Bosch Scharnieren. Nevertheless disruptions are inevitable, because "trains" cross each other regularly, and because unexpected delays occur at the stations. So, it cannot be prevented that trains stand still now and then, waiting for a signal that they can continue their journey. What can be done is organizing the work within the stations in such a way, that this passes as smootly as possible. Besides this, you can try to reduce the waiting times between the stations. Quick Response Manufacturing (QRM) pursues both objectives: optimally organized workstations, and smart workflow management between those stations. For the purpose of Quick Response Manufacturing, the factory floor was divided into task-oriented clusters of machines with multidisciplinary teams. Each of these Quick Response Cells has its own color. 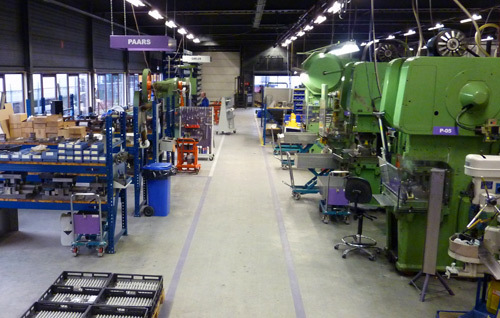 In many job shop environments, there is not much thought about the design of the factory floor. Often you see, for example, "functional departments". In the railway metaphor, these are comparible with stations at which only one type of person can enter or exit, for example only someone older than 75 with a walking stick. This results into a lot of unnecessary "train movements" and associated waiting times. However, in the early days of QRM much more attention was given to a tool that regulates the workstreams between the QRC’s, a tool to prevent traffic congestion. This tool is the Kanban variant POLCA. 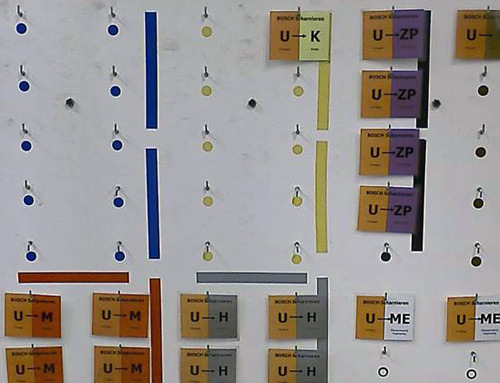 Kanban uses cards to inform supplying stations, that specific semi-finished products or materials have been processed, and that new ones can be supplied. This does not work in the case of customer-specific production, because then the quantity of different semi-finished products, and therefore also the quantity of required Kanban cards, becomes infinite. Therefore, POLCA uses cards with a capacity message. By sending such a card, a QRC informs a (potentially) supplying cell, that they have the capacity to receive - and process further - semi-finished products. If there is not such a card, the signal for the route to that station is red. This means that the supplying QRC should first work on an order that has to go to another station. POLCA cards are sent with the orders, and are returned later to the supplying QRC. That way, the people in that cell are informed that they can supply again to the cell mentioned on the card. Bosch Scharnieren started with QRM in 2007. After two months of preparation, they transformed their work floor into a network of loosely coupled QRC’s, within three weeks. Subsequently, they started to control the work streams between the QRC’s, with circulating POLCA cards. Bosch Hinges learned a lot during the past ten years, both about the layout of the QRC’s, and about optimally dividing the workstreams between those. To this end a job shop control system is needed, which regulates the "train traffic" between the QRC stations. This is done via signals, which indicate which trains should ride, and which trains should better stop and wait a little while. On paper, POLCA may appear to be the ideal signalling system, but this is not always true. According to Kaanen, this explains why not every job shop factory uses POLCA, where Kanban cards are seen in almost every Lean environment. QRM releases production orders on the basis of the desired delivery date. Starting with that date, it is calculated back when a certain "train" should start, including a time buffer for an estimated standstill period. To prevent clogging of the rail network, a maximum of X trains is allowed to run simultaneously. During the ride, one train will become more delayed than the other. Unexpected events can for example occur on the route to be traveled along the QRC stations. It can proceed immediately to the next station after processing it, as signalled with POLCA. The delivery date of that particular order is threatened the most. The software calculates this. According to Kaanen, the calculations for the second decision criterion roughly correspond with the Theory of Constraints (TOC) solution for project management. In that case, a time buffer is linked to each order. Next, orders with the lowest remaining percentage of time buffer, get priority. It is intriguing to see how Bosch Schanieren at first switched radically to autonomous production in QRC’s, with the production planning only regulated with POLCA-cards. Later, scheduling software was added again, be it that the software now tracks the orders in realtime, on basis of which the planning is adjusted continuously. According to Kaanen, the priority calculations are based on clear rules, including POLCA. However, for employees in companies that start with QRM, the planning software may resemble a black box. This is not a problem within Bosch Schanieren, since all their operators already understand the underlying idea. However, if you start with QRM, it may be wise to begin only with visible buffers and/or tangible POLCA cards. That way, everyone on the floor can learn why it is important to stick to the production sequence as indicated by POLCA, which makes the throughput as large as possible. As emphasized earlier, the core of QRM is the transformation of your company into QRC’s. In fact, these are self-managing teams with dedicated production resources. Bosch Schanieren learned a lot in the past 10 years, about the best way to organize these teams.